It is one thing to read articles about hypothyroidism symptoms online but quite another to hear the symptoms straight from real people. These are real people, like you and me, struggling with a collection of symptoms so hard to pinpoint that they baffle doctors in every country of the world. While we don’t know one another personally, the truth is that we are connected, just the same, in a particularly powerful way. We are living in the trenches together fighting a battle against this thing called hypothyroidism. The number of potential symptoms that can accompany hypothyroidism is not surprising, frankly, but rather obvious given the sheer power of thyroid hormone over the entire body. 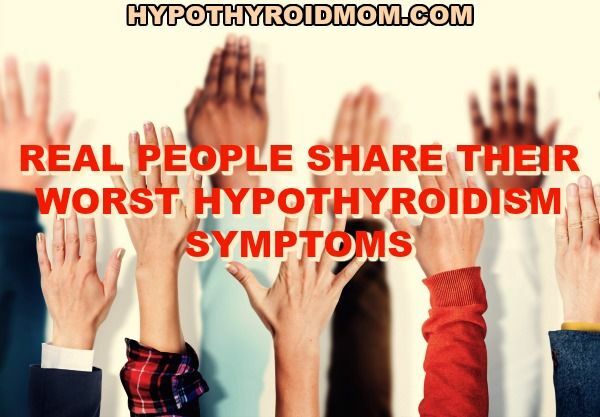 What is your worst hypothyroidism symptom? That’s the question I asked my one million followers on the Hypothyroid Mom Facebook page. It was in the form of a poll and the results may very well surprise you. A simple, 6-word question uncovered the truth about what lurks behind this wretched disease. And here are the results, in the order of the highest to lowest number of votes. 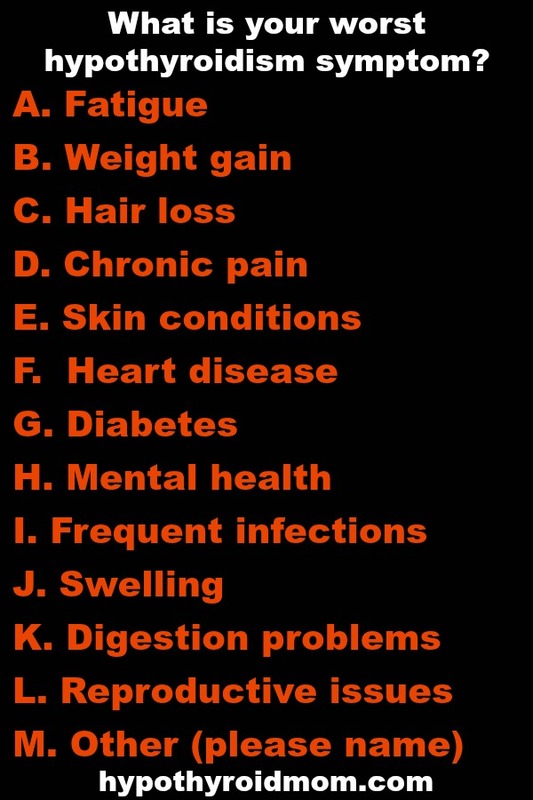 Most people responded that it was impossible to list only one symptom and that several were equally devastating. Some of the categories, like skin problems, were broad and many mentioned specific conditions in those categories which I included below. They are quite telling, really. I have been taking Levothyroxine for 25 years and luckily not had any major problems apart from when I tipped over to being hyperthyroid on 150mcgs daily and that was awful. Anyway after reducing my dosage I felt much better. However I have recently noticed I have become more breathless especially when going uphill and am shocked at having been diagnosed with Aortic Stenosis (leaky heart valve) although I eat a healthy diet and am very slim – yes I am hypothyroid and slim! Could the thyroid have contributed to my heart problem? Since hypothyroidism according to research required specific supplements to help heal not just your thyroid but the body as well, why can’t a true supplement be found? Yes, I have been on thyroid meds since 2011 and when looking back over ones life, I had a lot of problems that lead to this point. Back then, one was not subject to a doctor unless you were really sick. I had tried Amour, Levothyroxine and Natureroid and I think Natureroid was better. The last batch of Levothyroxine I have had serious fatigue and shortness of breathe. Got labs back waiting on Endocrinologist but I would like to go back to Natureroid or a thyroid supplement. Has anyone used a supplement?